Ahead of the talks, lawmakers were divided on even the scope of the discussions. Republicans and Democrats on the exclusive committee negotiating a border security funding proposal, who met for the first time Wednesday, have less than three weeks to strike a deal. And even before they started, lawmakers appeared divided on the scope of the talks and the what any agreement to avoid another damaging government shutdown might look like. Just hours before the talks began, President Donald Trump tweeted, "If the committee of Republicans and Democrats now meeting on Border Security is not discussing or contemplating a Wall or Physical Barrier, they are Wasting their time!" Republicans and Democrats on the exclusive committee negotiating a border security funding proposal are up against a Feb. 15 deadline to reach a deal before government funding again runs out. Lawmakers have appeared divided on the scope of the discussions and the nature of a possible agreement that would avert another potentially damaging government shutdown. While the group has jurisdiction over crafting a bill to fund the Department of Homeland Security, some Republicans, including House Minority Leader Kevin McCarthy and others close to the White House, suggested the group consider broadening discussions to include immigration policy, such as the legal status of hundreds of thousands of young undocumented immigrants known as "Dreamers," and other foreign nationals in the United States under temporary protected status. Sen. Lindsey Graham, R-S.C., chairman of the Senate Judiciary Committee, thought the group should also consider tackling the approaching deadline to raise the nation's borrowing limit to avoid another bruising political battle in March over the debt ceiling. That proposal was quickly dismissed by Senate Minority Leader Chuck Schumer. 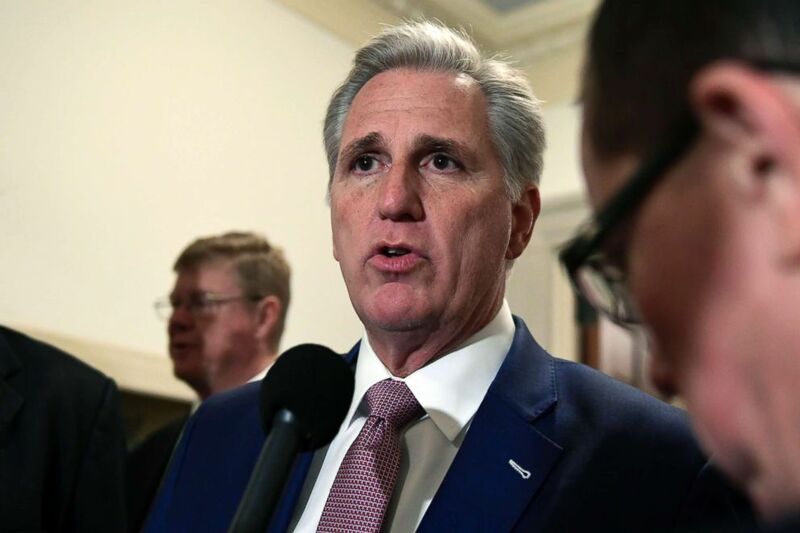 (Susan Walsh/AP, FILE) House Majority Leader Kevin McCarthy speaks to reporters as he arrives for a meeting on Capitol Hill in Washington, Nov. 14, 2018. House Democrats, now in the majority and in a position to push their policy agenda through the lower chamber, also are planning a number of votes in the coming weeks on standalone immigration proposals, including a pathway to citizenship for "Dreamers" that also would address the status of temporary protected status recipients, according to members and aides. Rep. Raul Ruiz, D-Calif., a former emergency room doctor, also is finalizing a proposal to create medical standards for the treatment of migrants in government detention, though elements of that effort could wind up in the funding deal hashed out by the appropriators. "Whatever it takes to solve the problem," McCarthy told ABC News. "I mean, the president was the reasonable one that went beyond the scope of what the Homeland appropriations bill said, because he listened to what Democrats were saying. He knows there's a concern out there, and I think the American public looks at government and says you have to find common ground." Across the aisle, House Majority Leader Steny Hoyer of Maryland said that the negotiations will not include discussions of immigration policy like Deferred Action for Childhood Arrivals as Democrats seek to narrow the scope of the talks. "I don't expect that to be part of the negotiations," Hoyer told reporters Tuesday. "We have a real issue trading the futures of young dreamers, for example, for a ... long wall across the U.S.-Mexico border, and we're certainly not going to swap something permanent for something temporary," Rep. Joaquin Castro, D-Texas, the chair of the Congressional Hispanic Caucus, said in a recent interview about the possibility of extending temporary legal status in exchange for wall funding, an earlier proposal floated by the White House and President Donald Trump. Looming large over the talks is Trump, who told the Wall Street Journal over the weekend that he was doubtful House members and senators could reach a deal, and that another shutdown is "certainly an option." (Ron Sachs/CNP/Polaris) Rep. Nita Lowey answers reporter's questions as she departs the Senate Chamber at the US Capitol in Washington, DC, Jan. 24, 2019. "I raised my kids in Queens. President Trump grew up in Queens. As a Queens boy, he says he knows how to make a deal. 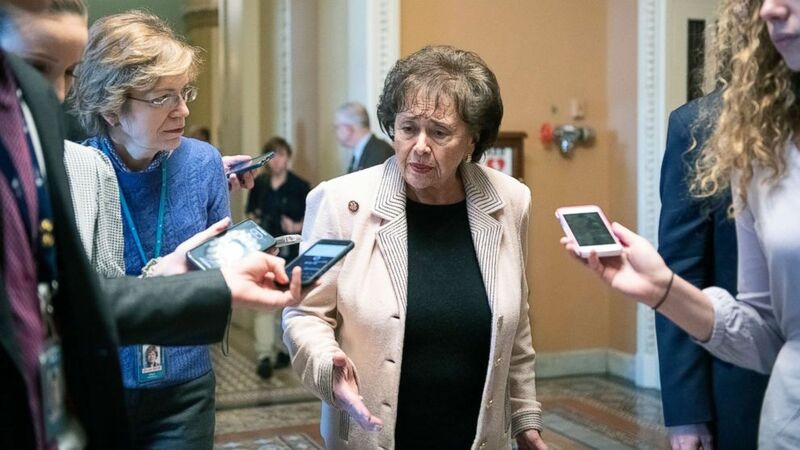 We should talk the same language," House Appropriations Chair Nita Lowey, who is leading the border security negotiations, told ABC News Live. "It's outrageous to me that this president would even threaten another shutdown," the New York Democrat said. "Doesn't he understand the suffering?" Rep. Tom Graves, R-Ga., also part of the negotiating team, sounded an optimistic note, setting aside Trump's pessimism over a potential deal. "He may place the odds at less than 50 percent, but to me that just presents a great challenge for us to take on. And I think we're up to it," Graves told ABC News Live. While they have largely resisted Trump's push for a wall and stood together against his demands during the shutdown, some Democrats acknowledge that additional funding for a physical barrier on the southern border may be part of any compromise. 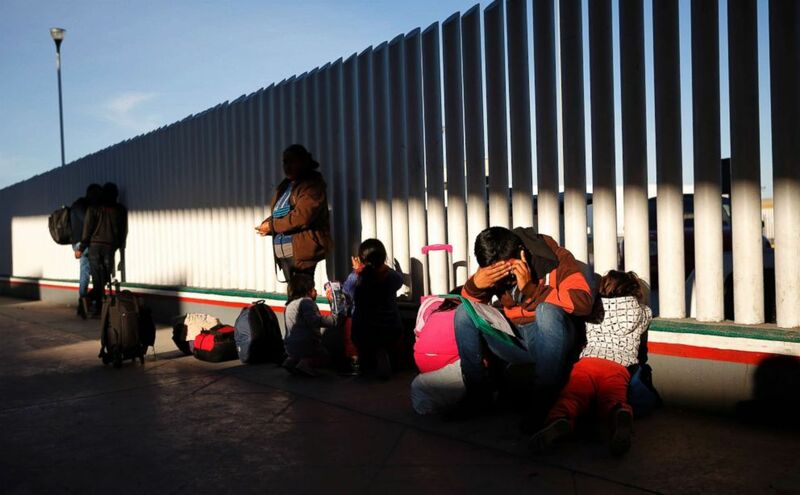 (Gregory Bull/AP) A migrant sits with his children as they wait to hear if their number is called to apply for asylum in the United States, Jan. 25, 2019, in Tijuana, Mexico. House Democratic Caucus chair Hakeem Jeffries said Democrats are "willing to support fencing where it makes sense in an evidence-based fashion." It's not clear the Democratic Party's progressive flank would accept that, which could pose a challenge for House Speaker Nancy Pelosi should Trump sign on to such an agreement. "There's a clear position that we don't support a border wall, whatever you call it," said Rep. Pramila Jayapal, D-Wash., a leader of the Congressional Progressive Caucus. "A wall is not the answer. It never has been." Lawmakers will meet formally for the first time on Wednesday, but negotiations are expected to continue largely at the staff level for the rest of the week. Another conferee, Republican Rep. Chuck Fleischmann of Tennessee, told ABC News he's eager to get started given the Feb. 15 deadline to pass the committee's product through Congress. "Time is of the essence, and I think the sooner we put our respective positions on the table, the more beneficial it will be to the entire process," Fleischmann said. "This is an appropriation bill and appropriators have traditionally been problem solvers. I'm optimistic that we can get it done." Even though Congress is on the clock to produce a deal, the House and Senate are expected to leave Washington for the balance of the week.